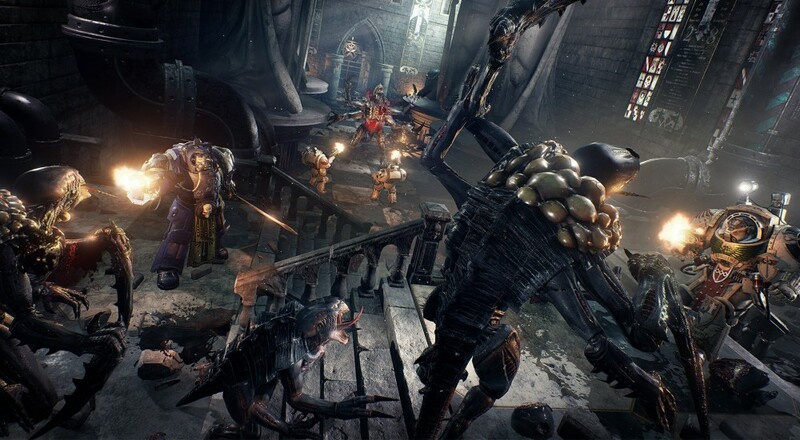 Space Hulk: Deathwing arrived on PC last year and while it managed to capture some of the feeling and atmosphere of being a walking killing machine sent inside a derelict spacecraft filled with relentless aliens out to harvest your genes, it fell short in a number of other ways. The latest update, though, teases at some great things in the works. There have been a few updates to the title over the past few months, many of which have focused on improving the overall stability of the game, but the latest one is pretty significant as it introduces a new way to play the title in co-op, and also lays out some future features. The big addition in this update is the "Special Mission," a new map you can choose within the Multiplayer setup. This map generates a randomized sequence of missions to complete using the level layout of an existing chapter, i.e., you'll still be on the same map as Chapter 1 of the game, but you won't be following the same mission objectives as before. At the moment, there's only one of these Special Mission maps available, but the development team plans on expanding that, eventually, to all nine chapters. That would go along way towards making the co-op portion of the game a whole lot more fun and worth replaying with a group of friends. Those are some pretty big changes and I can't wait to see how, exactly, they're implemented as it would definitely mean some pretty significant changes to the way the co-op currently works. Space Hulk: Deathwing is currently available on PC via Steam for $39.99. The PlayStation 4 and Xbox One versions are slated for a Q4 2017 release, so chances are good we'll see those features get implemented into the PC version later this year.